Is New York’s Future Sustainable? UPDATE: There has been a change in the speaker lineup for the Gotham Center’s event on the future of sustainability in New York City. Eric W. Sanderson of the Wildlife Conservation Society who recently spoke at an event hosted by the Institute will be speaking, as well as Denise Hoffman Brandt, Director of the Graduate Program in Landscape Architecture at the Spitzer School of Architecture, CUNY City College. 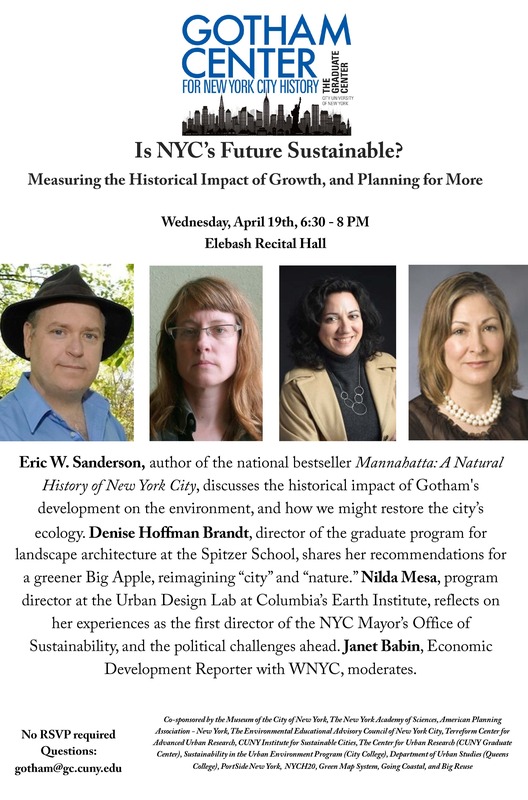 The Gotham Center for New York City History presents the panel discussion Is New York’s Future Sustainable? Measuring the Historical Impact of Growth, and Planning for More. Eric W. Sanderson, Senior Conservation Ecologist at the Wildlife Conservation Society, founder of the Welikia Project, and author of Mannahatta: A Natural History of New York City, discusses the historical impact of development on the environment of New York City, and how we can restore the city’s ecology. Denise Hoffman Brandt, Director of the Graduate Program in Landscape Architecture at the Spitzer School of Architecture, CUNY City College, reimagines the ideas of “city” and “nature” to make New York City greener and more sustainable. Nilda Mesa, director of urban sustainability and equity planning at Columbia University’s Earth Institute, reflects on her experiences as NYC’s first Director of Sustainability, and the political challenges ahead. Janet Babin, Economic Development Reporter for WNYC, moderates.